Asimo’s activity has tapered off in recent years so this is not a huge surprise. Honda’s official Asimo site itself hasn’t been updated in over a year. Recent humanoid robots in media are more likely to be in context of events like DARPA Robotics Challenge or from companies like Boston Dynamics. Plus the required technology has become accessible enough for us to build our own two-legged robots. So its torch has been passed on, but Asimo would be remembered as the robot who pioneered a lot of thinking into how humanoid robots would interact with flesh and blood humans. It was one of the first robots who could recognize human waving as a gesture, and wave back in return. Many concepts developed from Asimo will live on as Honda’s research team shift focus to less humanoid form factors. We can see Honda’s new ambitions in their concept video released during CES 2018 (embedded below.) These robots are still designed to live and work alongside people, but now they are specialized to different domains and they travel on wheels. Which is actually a step closer to the Jetsons’ future, because Rosie rolls on wheels! Ever dreamed of a real, life-sized Transformer in your garage? The Turkish startup Letrons now offers you exactly that: Their animatronic Autobot drives like a car, transforms like a Transformer, and supposedly fights off space threats with its built-in smoke machine and sound effects. Letrons’s Transformer seems to be built upon a BMW E92 coupé chassis. According to the company, the beast is packed with powerful hydraulics and servo motors, allowing it to transform and move fast. Sensors all around the chassis give it some interactivity and prevent it from crushing innocent bystanders when in remote-control mode. Interestingly, its movable arms aren’t attached to the body, but to its extendable side-wings and feature hands with actuated wrists and fingers. The Autobot also can move its head, which pops right out of the hood. Admittedly, Letrons must have spent a lot of time on the dark side of the moon and working in secrecy before they released footage of a working and polished prototype. It’s unclear if Letron’s Transformers will cooperate with the US military in solving armed conflicts, but they are certainly good for a show. Enjoy the video below! Coming from a lab in France is The Poppy Project, an open source humanoid robot that’s at least as cool as ASIMO. 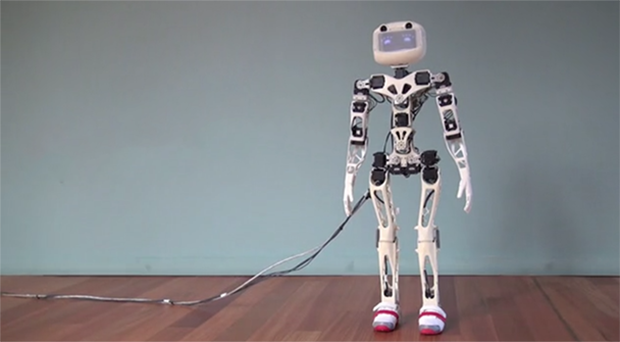 Poppy was designed as an affordable bipedal robot for use in education and art. It’s a small robot at just over 80 cm in height, but it can walk, move its arms, rotate its torso, and interact with bags-of-meat humans with two cameras and an LCD face. Although Poppy is open source, that doesn’t mean it’s exactly cheap; the current design includes twenty-one Robotis Dynamixels MX-28 robotic actuators, actually servos with magnetic encoders, temperature sensor, and an ARM microcontroller. These actuators sell for about $200, meaning Poppy contains $4000 in motors alone. The estimated cost of the entire robot is €7500-8000, or about $10,000 to $11,000 USD. Still, there’s an incredible software platform that comes along with Poppy, and being open source any enterprising engineer can take up the project and attempt to bring the costs down. We’d love to take one out for a walk. Just get rid of the hands. That’s too far down the uncanny valley for us. Video below.